Review: Wansview $35 Security Camera Streams HD Video, but Does it Compete with Home Security? Looking for a miniature, compact, and extremely affordable home security camera? Look no further than the indoor camera by Wansview, a $35 home security camera that streams HD video straight to your iPhone or Android device. With simple set-up, through the Wansview you’ll be monitoring your home—or spying on your pet—through your smartphone in no time. The device even has night vision to keep you up to date late into the night. But how does this Wansview stack up to other stand-alone home security cameras on the market?Let’s take a look. For a device so small and compact, Wansview has a lot going for it. 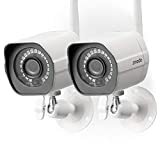 This is one of the most affordable security cameras in the stand-alone space, clocking in at $35, and it gives users a number of the essentials that attract them to smart cameras in the first place. The Wansview can be mounted on a wall, table, or ceiling. The live-stream from the camera is sent directly to an Apple iOS or Android smartphone, tablet, or PC application. With its 60mm width and length, the Wansview has a slim body, it’s rather impressive the device is able to maintain a 720p high definition video stream. The product has also been reported to have an excellent customer service team. Wansview also supports remote viewing via iOS and Android mobile devices, Windows PC, Apple Mac system, and web browsers. All-in-all, the Wansview camera is well-priced device, well-reviewed, and it stacks up well against the rest of the market for a very affordable price at $35. Popular competitors like Nest and Arlo are both priced at upwards of $150. The problem with the Wansview is less in its abilities as a product, and more in its abilities as a home security device. This camera streams video in the home and sends push alert notifications, but it doesn’t fully secure your home. It’s a stand-alone device that only has the capacity to monitor what’s in front of it. If a break-in actually occurs at your home, you’ll be forced to call the cops once you receive the push alert notification, and if for some reason a notification is not received, you’ll be out of luck. On top of not fully monitoring the home, Wansview does not have many of the other essentials of an all-encompassing home security system, including smoke and fire protection, flood detection, life alert devices for older adults, and other devices that will keep you fully protected in the home. All essential devices that are necessary to be fully protected. While Wansview clocks in at a reasonable price, we suggest only using the device to secure small fixtures and not your entire home. When it comes to your home, stick with the pros.